SEO is always been the prime factor for any blog. Bloggers and webmasters usually get a lot of issues while working with their blog designing. Lets know in an infographic how SEO and effective pagination issues can be fixed. With this article you can learn how to fix each of these elements so that you can also create SEO-friendly pagination for your webpages which in turn will increase the blog audience. Pagination, the practice of segmenting links to content on multiple pages, affects two critical elements of search engine accessibility. Crawl Depth: Best practices demand that the search engine spiders reach content-rich pages in as few "clicks" as possible (turns out, users like this, too). This also impacts calculations like Google's PageRank (or Bing's StaticRank), which determine the raw popularity of a URL and are an element of the overall algorithmic ranking system. Duplicate Content: Search engines take duplication very seriously and attempt to show only a single URL that contains any given piece of content. When pagination is implemented improperly, it can cause duplicate content problems, both for individual articles and the landing pages that allow browsing access to them. 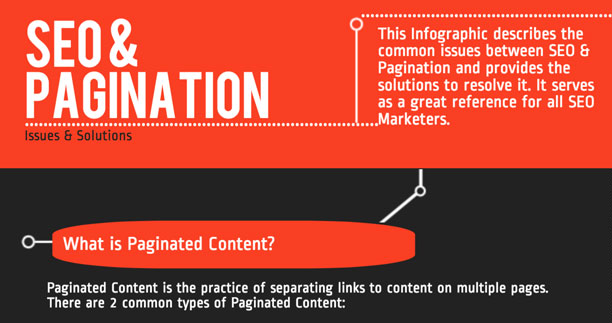 Let's see the issues and their solutions in the below infographic while using SEO & Pagination.